The general definition of an animal hoarder is someone who keeps an unusually large number of pets on their premises, and fails to care for them properly. Sadly, 58 cats have just recently been rescued from a cat hoarder’s house in Lincoln, California. If you suspect that your neighbor is an animal hoarder, go over and knock on their door with some excuse – maybe to borrow a cup of sugar or see if an important piece of mail got delivered to them by mistake. Then try to see if you see any signs of hoarding inside. If the neighbor quickly comes out on the porch, pulling the door nearly closed behind them, that can mean that they are ashamed of the mess inside and don’t want you to see. Further investigation may be necessary. Use your ears to listen for the sounds of cats, your nose to notice any unpleasant smells emanating from your neighbor’s houses, and your eyes to watch for people bringing in too many bags of food or litter and for many cats roaming around the property. Other things to watch for include excessive clutter outside the house, lots of flies at the windows, a neighbor who seems reclusive and doesn’t want to let anyone in their house. 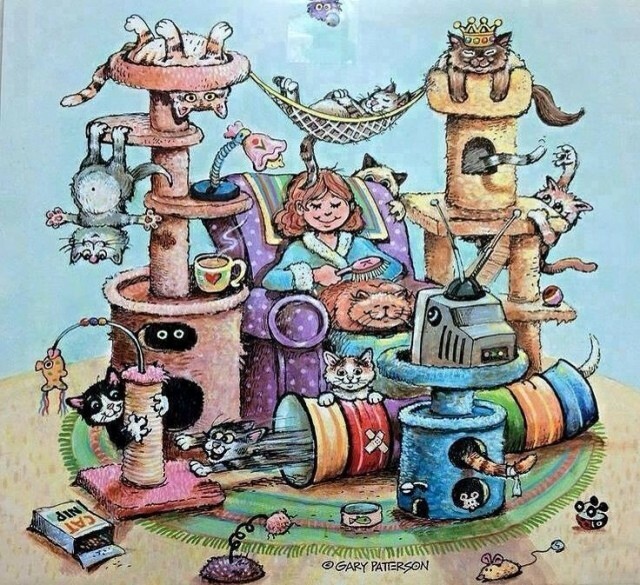 Sometimes a cat hoarder is just a cat lover that has become overwhelmed by the amount of work there is in caring for a lot of cats. If that is the case, maybe you can offer to help out. But if the hoarder has stepped over that line, if there is mental illness at work, and the cats are in seriously unhealthy conditions, you will want to contact animal control, the health inspector, or even the police. Hoarded cats usually suffer from neglect rather than violent abuse. The hoarder often sees themselves as saving the cats, and becomes immune to the smell and the mess. They are not deliberately cruel to animals. Early intervention is key. Both for the health of the cats, and also because many cats raised in a hoarder’s home have characteristics of feral cats, and are therefore harder to rehome. Please add your own ideas of what to look for, and any experiences you’ve had, so we can all do what we can to stop this from happening again. Why Do Kitties Like to Play with Yarn? Sorry: number of cat, some rabbits and ferrets. Sulke mense moet bitter swaar gestraf word! Patricia, were there any signs that you could see that there was animal hoarding going on in that house? Actually, from the outside there was nothing. And it is a tiny house. I learned about it after Animal control had recued all the animals. I wonder if that isn’t the way it is in many cases, and there is really no way to know that it is going on right in your own neighborhood.